Eiichiro Oda’s One Piece manga has taken another milestone as it was recently awarded by the Guinness World Record for having “the most copies published for the same comic book series by a single author.” The manga has printed 320,866,000 copies worldwide as of December 2014. The official website for One Piece shared the announcement on Monday. Weekly Shonen Jump editor Yoshihisa Heishi received the award in behalf of Oda who couldn’t make it in the awarding ceremony held in Tokyo. The series has been serialized on Weekly Shōnen Jump magazine since 1997, and has also been published in several countries worldwide. Its anime adaptation began airing in 1999 and is still ongoing. Congratulations to Oda and all the staff behind the success of One Piece! Posted in News and tagged "One Piece" Manga Becomes a Guinness World Record Holder, Eiichiro Oda, Guinness World Record, manga, One Piece. Bookmark the permalink. 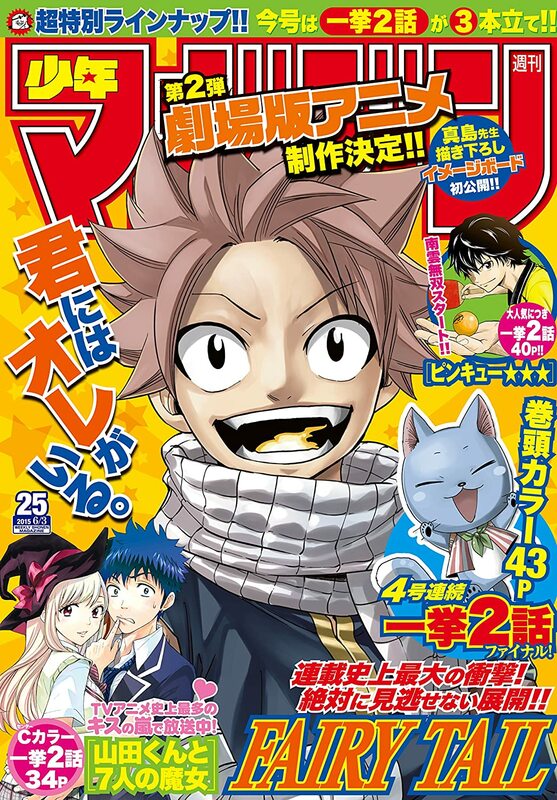 The 25th issue of Kodansha’s Weekly Shōnen Magazine confirmed that a second anime film adaptation of Hiro Mashima’s Fairy Tail manga has been green-lit! The first film, titled “Fairy Tail the Movie: Phoenix Priestess”, was released in 2012. An imageboard art for the film drawn by Mashima himself is also unveiled in the magazine. The latest issue also includes two new chapters of the manga which tease the fans about a shocking development in the story. The ongoing series began its serialization in 2006 and an anime TV adaptation also started airing in 2009. Posted in Movie and tagged anime, anime film, anime movie, Fairy Tail, Fairy Tail anime movie, Fairy Tail the Movie: Phoenix Priestess, manga. Bookmark the permalink. One-Punch Man, a webcomic originally created by ONE, is confirmed to have an anime adaptation this year! It will be directed by Shingo Natsume under Studio Madhouse, and Chikashi Kubota will be the character designer. Tomohiro Suzuki, on the other hand, will handle the series composition. The official website for the anime adaptation recently unveiled some of the voice actors for the upcoming series which include Makoto Furukawa as the protagonist Saitama and Kaito Ishikawa as Genos, the main character’s disciple. Yuuki Kaji (Speed of Sound Sonic) and Aoi Yūki (Tornado of Terror) will also join Furukawa and Ishikawa in the cast. Yūsuke Murata began his remake of One Punch Man in 2012 on Shueisha’s Young Jump Web Comics website. Both ONE’s webcomic and Murata’s digital manga remake are still ongoing. Posted in Anime and tagged anime, anime adaptation, Aoi Yūki, Genos, Kaito Ishikawa, Makoto Furukawa, manga, ONE, One Punch Man anime, One Punch Man anime adaptation, One Punch-Man, Saitama, Shingo Natsume, Speed of Sound Sonic, Studio Madhouse, Tomohiro Suzuki, Tornado of Terror, Yusuke Murata, Yuuki Kaji. Bookmark the permalink. 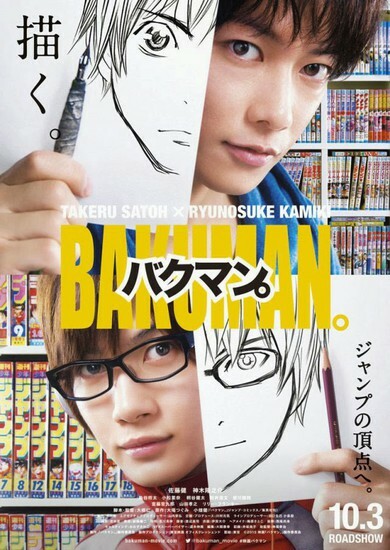 The live-action film adaptation of Tsugumi Ohba and Takeshi Obata’s manga “Bakuman” is confirmed to premiere on October 3! The report was made by Mainichi Shimbun paper’s Mantan Web site where they announced the movie’s premiere date. The site also revealed a visual for the film which casts Takeru Satoh and Ryunosuke Kamiki as Moritaka Mashiro and Akito Takagi, respectively. Joining them are Kenta Kiritani as Shinta Fukuda, Sarutoki Minagawa as Takurō Nakai, Hirofumi Arai as Kazuya Hiramaru, Nana Komatsu as Miho Azuki, and Shōta Sometani as Eiji Niizuma. Hitoshi Ōne is directing the said film. The manga also had an anime series adaptation which run from 2010 until 2013 with three seasons containing 25 episodes each. It tells the story of two friends (Mashiro as the artist and Takagi as the writer) who aspire to become well-known manga artists. Bakuman was serialized on Shueisha’s Weekly Shōnen Jump magazine from 2008 until 2012. Go to the movie’s official website to stay updated! Posted in Movie and tagged Akito Takagi, anime, Bakuman, Eiji Niizuma, Hirofumi Arai, Hitoshi Ōne, Kazuya Hiramaru, Kenta Kiritani, live-action film, live-action film adaptation, manga, Miho Azuki, Moritaka Mashiro, movie, Nana Komatsu, Ryunosuke Kamiki, Sarutoki Minagawa, Shinta Fukuda, Shōta Sometani, Takeru Satoh, Takeshi Obata, Takurō Nakai, Tsugumi Ohba. Bookmark the permalink. Shingo Suzuki is returning as the director and character designer for the second season of K anime this year! 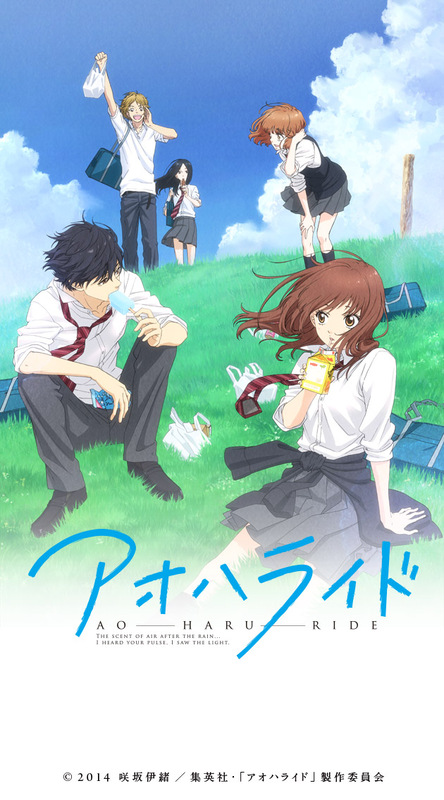 A video that was uploaded on Wednesday revealed that the sequel will premiere this fall season, and GoHands will again produce the anime series which was first aired on October 5 to December 8, 2012. The 13-episode anime was followed by K: Missing Kings, an anime film which was released on July 12 last year. The series has also spawned several manga adaptations written by GoRA, and a visual novel game developed by Otomate was also released in 2014. Posted in Anime and tagged anime, anime film, GoHands, GoRA, K Anime, K anime second season, K project, K: Missing Kings, Kaneki, manga, Otomate, second season, sequel, Shingo Suzuki, visual novel game. Bookmark the permalink.